This study randomizes the interview method for the Progress out of Poverty Index®, a short survey for estimating consumption-based poverty rates for participants in propoor programs. A face-to-face interview in participants’ homes is the most accurate, but it is also the most costly. In the test here in a poor, rural area in India, mis-reporting is disconcertingly frequent, yet the distribution of responses to survey questions—and estimated poverty rates—usually does not differ systematically between a given alternative method and the at-home benchmark. 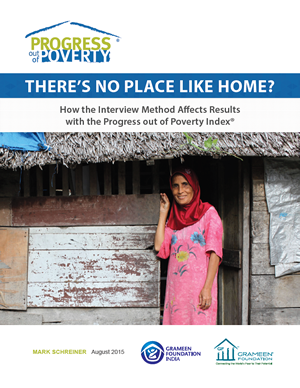 Estimated poverty rates, however, do differ across alternative methods, because completing an interview is linked both with the method and with participants’ poverty. To the extent that these results generalize, the PPI® can be used with alternative interview methods without affecting results as long as the alternative uses an enumerator and has the same (high) completion rates as with face-to-face, at-home interviews.